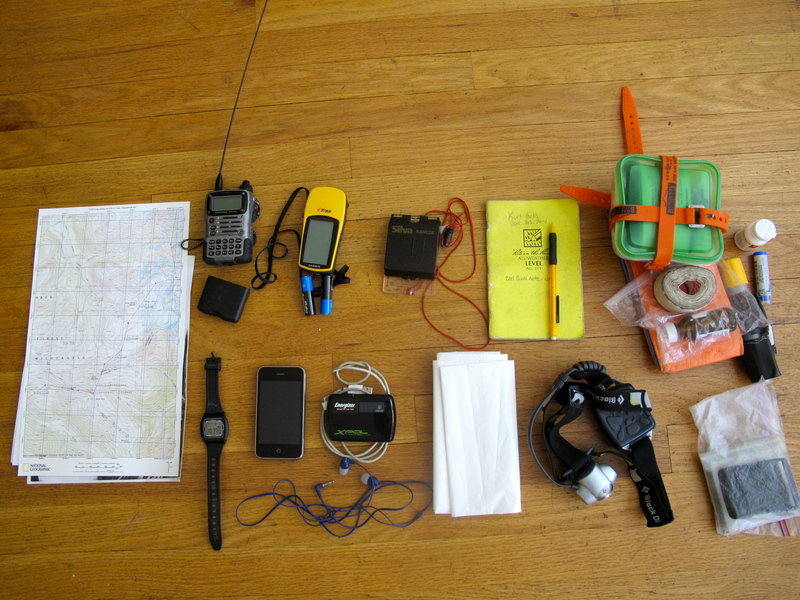 Backcountry mountaineering, you say? How is that different from traditional mountaineering? Well, it’s in the approach distance. Most mountaineering trips in the Cascades require a few hours of hiking to get from the car to a high camp, usually on well-maintained trails and easy sub-alpine terrain. This isn’t the case for my upcoming objective; I’m headed into the most remote volcano in the Cascades this week–Glacier Peak–and have a 20 mile one-way distance car-to-summit to contend with. 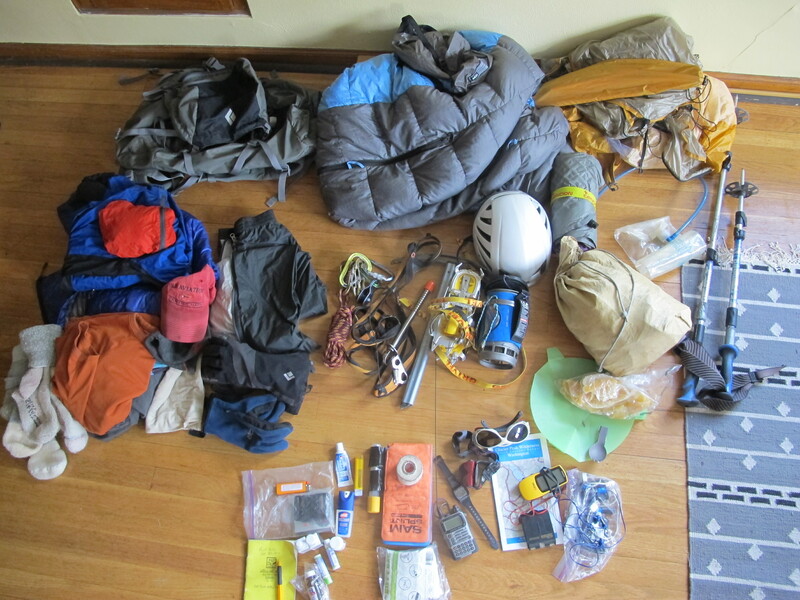 So how does my strategy change for backcountry mountaineering? Initially, I wasn’t thinking that there would be much of a difference, but there must be given the amount of time I’ve spent with my gear today. My main concern, as usual, is weight. There are other factors that are conspiring to have me leave some standard items out of my pack. 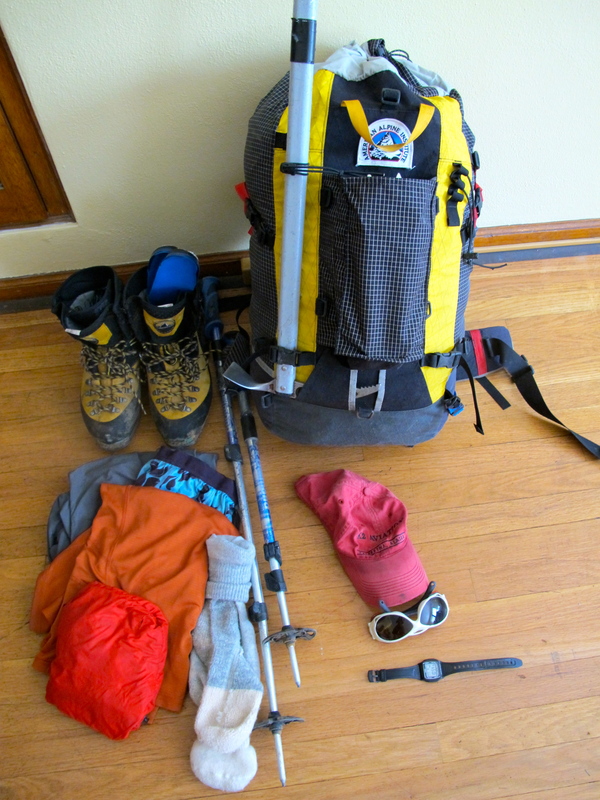 We have to ride mountain bikes about 7 miles up a closed gravel road to reach the trailhead, so I want a pack that is quite compact and balanced, so that it doesn’t push me around while peddling uphill. 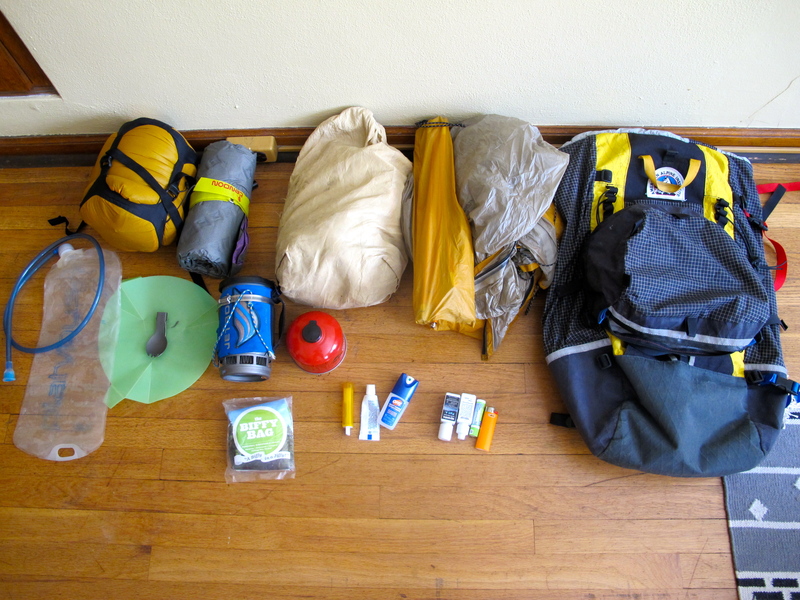 We’re also concerned with the potential for sub-optimal trail conditions (downed trees, creek crossings, etc), so I’m looking for a streamlined pack where I don’t have much, if anything, hanging off the outside of the pack. The climbing along our chosen route–the Disappointment Peak Cleaver with variations onto the White Chuck, Gerdine, and Cool Glaciers–is of moderate technical difficulty, especially considering that it’ll still be blanketed in a ton of last winter’s immense snowpack. 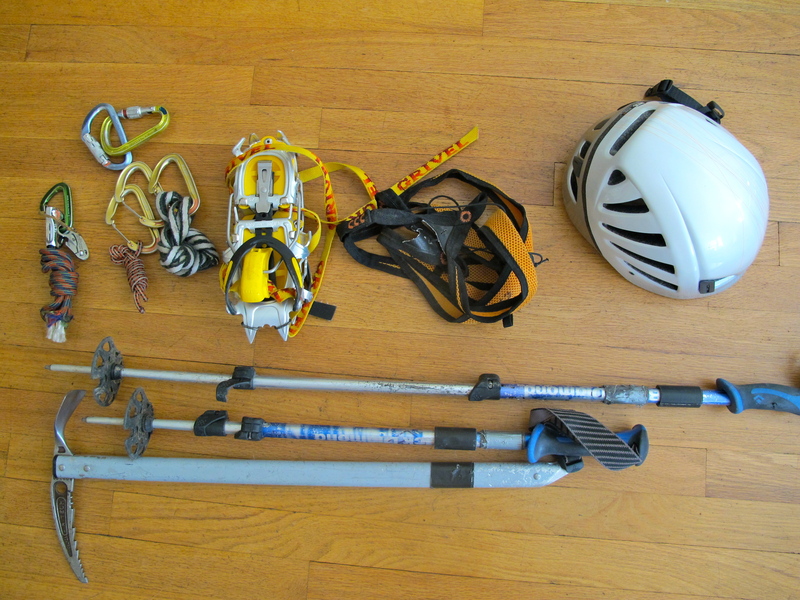 As such, I’ve gone with aluminum crampons, my lightest harness, and lightest helmet to shed some serious weight while still carrying the essentials. I did bring an ice axe when a Black Diamond Whippet ski pole could probably suffice. So what’s in there exactly? Of course, I made a few concessions in my ultralight strategy. 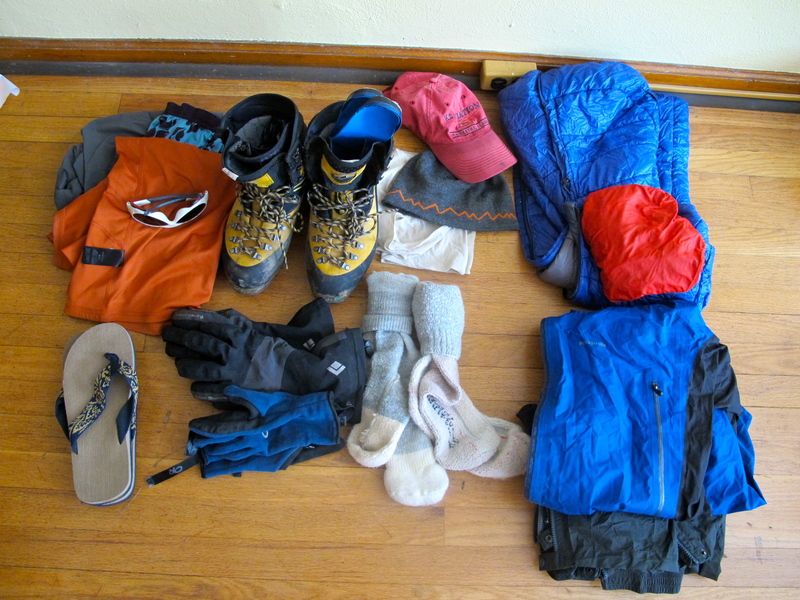 I brought two pairs of gloves and two pairs of socks since having wet hands or feet can make a trip really miserable. I also threw in my iPhone so I could have music for the trail and a potential emergency communication link. I swapped out my light Petzl Tikka XP for the Black Diamond Storm headlamp, so that I could navigate the darkness with confidence on our summit attempt. Finally, after much self-torment, I brought my heavier sleeping bag (which added 7 ounces), so I could get a solid night’s sleep. What would I comfortably change if I really wanted to? Now all I have to do is hope that our summer weather has actually arrived and rest my legs! Do you really need boots as heavy as Nepal Evo? I didn't need boots that heavy, but my options were limited. I wore tennis shoes for the 7 mile approach bike ride and the initial 7 miles of the hike, which was on great trail. After that I swapped into boots. I chose the heavier boots for two reasons. One--my light boots (Kayland Apex Rock) are worn out and they get wet within a few hours of getting on snow. And two--I like having heavier boots for kicking steps when guiding. It makes for an easier hike and climb for everyone else when they have great steps to use. The folks I was climbing with were wearing Scarpa Charmoz boots and they were perfect for the climb. Just wondering what the pack was/is and size? The pack is manufactured by CiloGear, a company out of Oregon. While it is advertised as a 60L pack, they can expand much larger if necessary. I use a women's prolite also (and I'm 6' tall - male). It's excellent: small, light, and warm. My overhanging head or feet can be raised off the ground using any number of things already in my pack, or with the pack itself. Homeopathic "medicine"? You can save a few more ounces by leaving the sugar pills at home too.